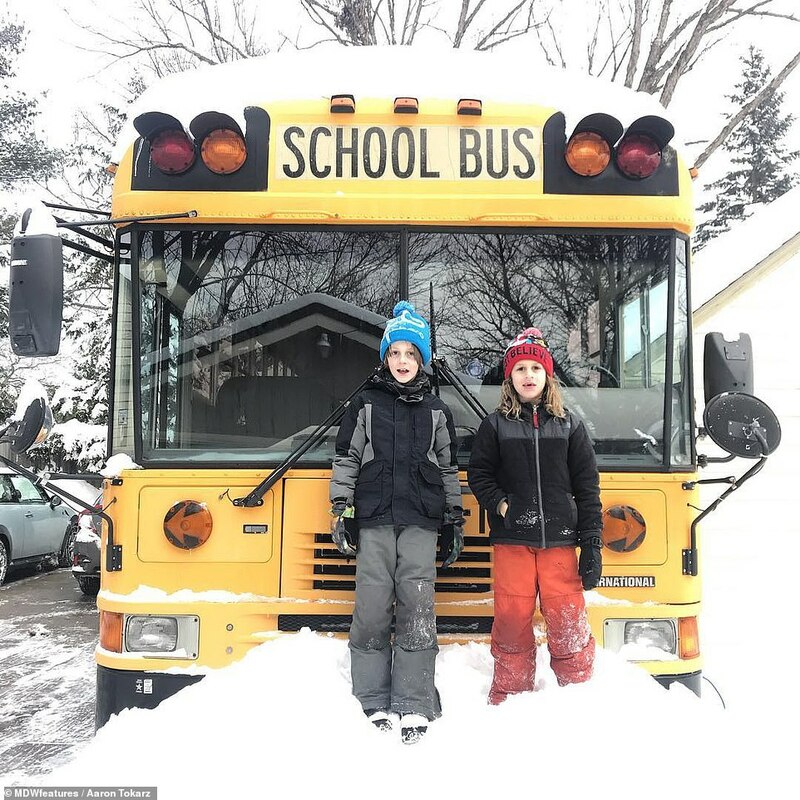 Meet the spontaneous couple who gave up everything and moved their children into an old school bus in a bid to spend more time together as a family – though one of the youngsters now wants to go back to school. 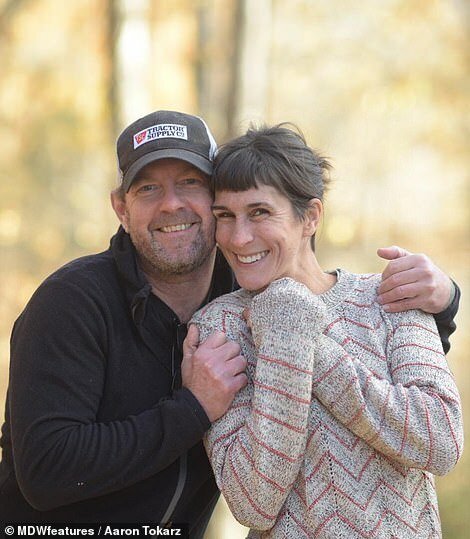 Wedding photographers Aaron, 45, and Philan Tokarz, 43, from Rockford, Illinois, purchased a school bus advertised on Facebook for just $4,000 (£3,060) and spent $30,000 (£23,000) converting it into home on wheels. 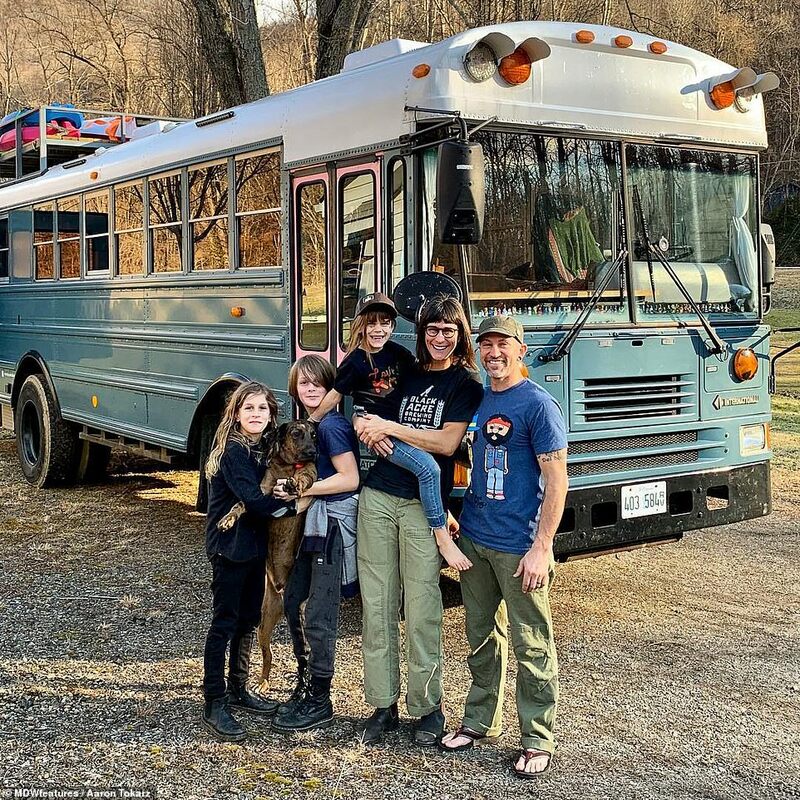 They then rented out their traditional 3,000-square-foot house and moved into the 225-square-foot vehicle with their three children, Cashin, 11, Brig, nine, and Freya, aged seven, last summer and the quintet have been on the road since. Despite the free lifestyle, the oldest of the three Tokarz children, Cashin, says he wishes he was back at school but his parents are convinced the long-term benefits of travel will pay off and he will become a ‘better human’. After years of living a conventional lifestyle the Tokarzs, who have been together 14 years, said they became sick of the time they were spending doing everyday chores like cleaning their house and realised that they weren’t spending enough time together. 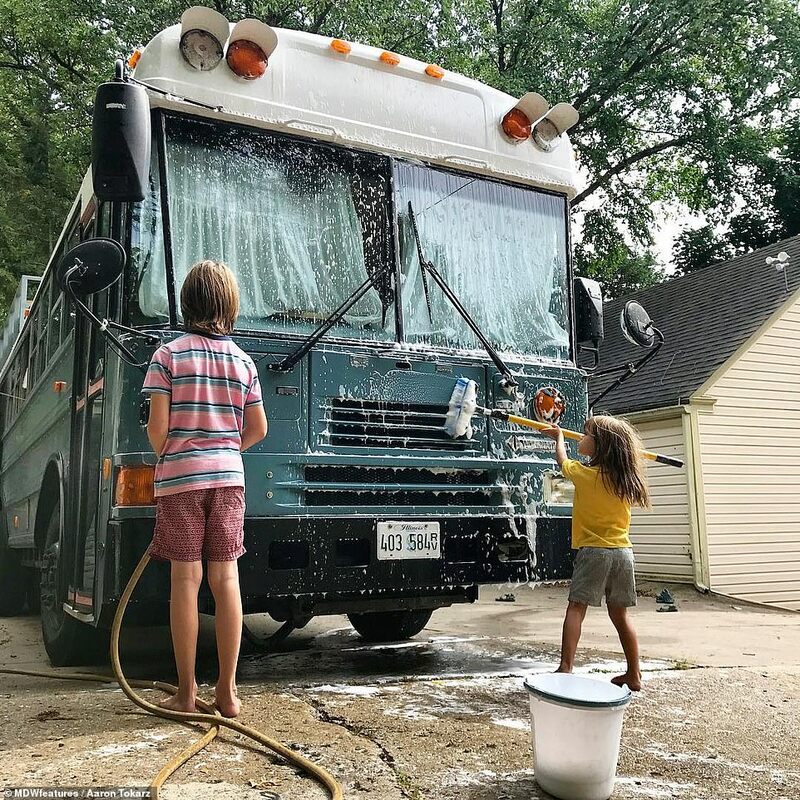 In a bid to simplify their lives and be more present with their children they decided to hit the road in a school bus and travel around the U.S.
Having looked at many disappointing and uninspiring RVs, they eventually decided to buy a 1999 International Amtran Genesis 30′ Flat-Front puller school bus. 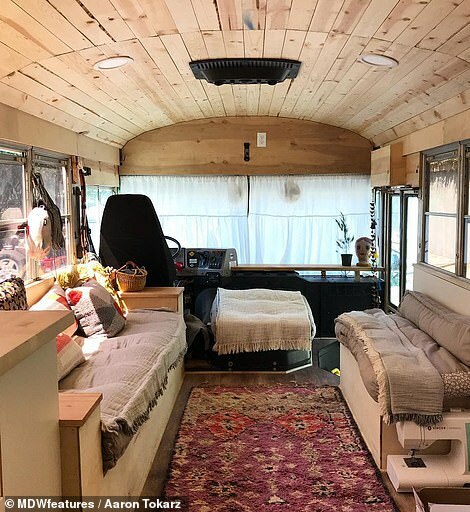 They renovated the bus themselves from November 2017 to July 2018 and went about turning it into the beautiful ‘skoolie’ home of their dreams. 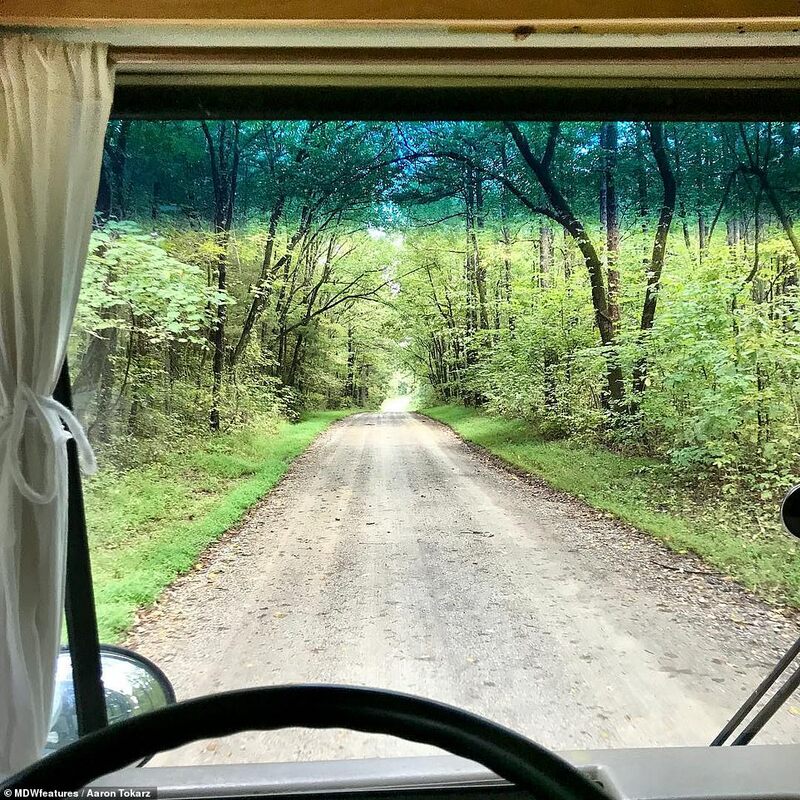 To keep friends and family in the loop, they started posting about their journey via Instagram as ‘Simplyusandabus’. 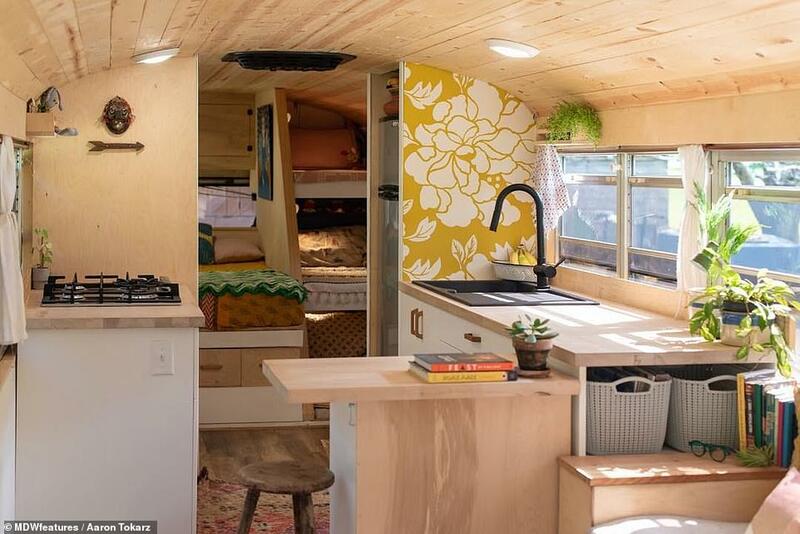 Their renovated bus includes all the mod cons and even has a 70-square-foot roof deck, which is perfect for storing outdoor activity equipment. 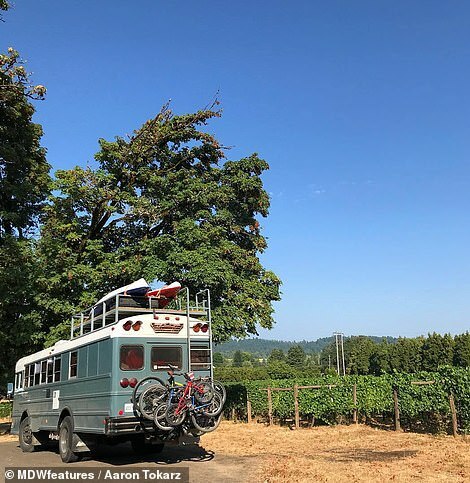 The Tokarz family finally moved into their mobile mini home on July 11, 2018, and began their journey with Wisconsin, followed by Minnesota, North Dakota, Montana, Idaho, Washington, Seattle and Oregon. They return to Illinois occasionally to do wedding photoshoots before hitting the road again. ‘As a family, we enjoy being outdoors together, exploring new cities, and being active. While on the road, you can find us hiking, rock climbing and doing water sports such as snorkelling and kayaking. 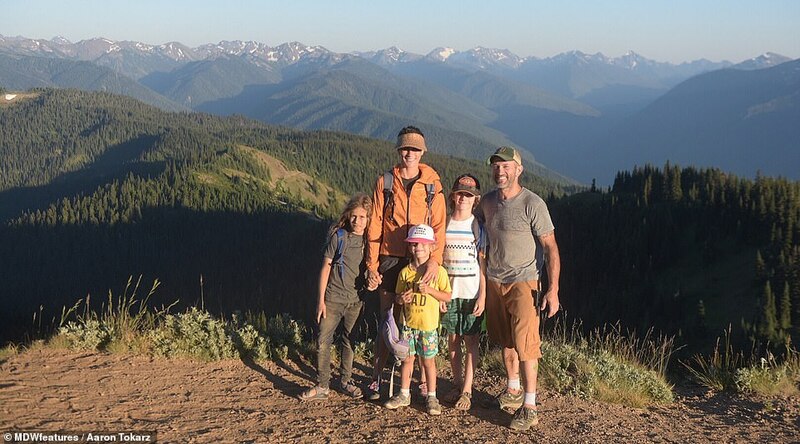 We try to challenge ourselves and our kids to try new things and have a greater appreciation for life,’ said Aaron. ‘In the Fall of 2017, we realised that although we worked from home and we were around our kids a lot, we weren’t present for them or for each other. We were spending so much time cleaning the house, doing yard work, being social in our community, that we were missing out. ‘Life was too fast paced, and we found ourselves surrounded by too many meaningless material possessions. We were part of the community, but we weren’t connecting with any other families. We needed a change, to simplify life and to be more present with each other and our kids. ‘Philan suggested that we make a big change. We contemplated moving to North Carolina for a change of pace but the more we thought about it, the more we realised we needed to be on the road to explore our country with our kids. ‘We looked at RVs mainly, but they were all too similar and there wasn’t really a feasible way to completely customise them. Also, school buses are much safer, after all, they are built to safely transport our children to and from school. 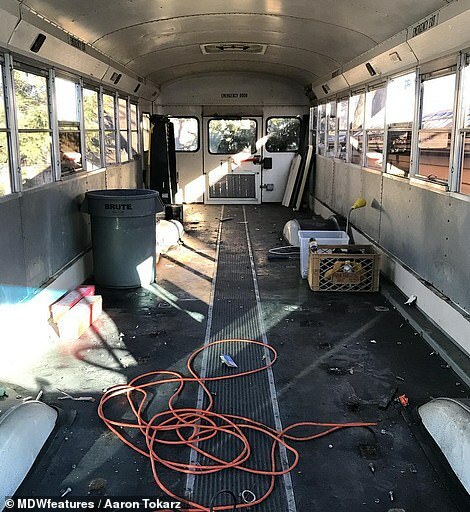 ‘We gutted and renovated the bus from November 2017 to July 2018. It cost us $30,000 to do it ourselves. It took a lot of labour to get our ‘skoolie’ on the road. To start with, the couple looked at buying an RV but they found that the vehicles were all too similar and there wasn’t really a feasible way of completely customising them. Above, the family on top of the roof deck where they store their outdoor activity equipment. 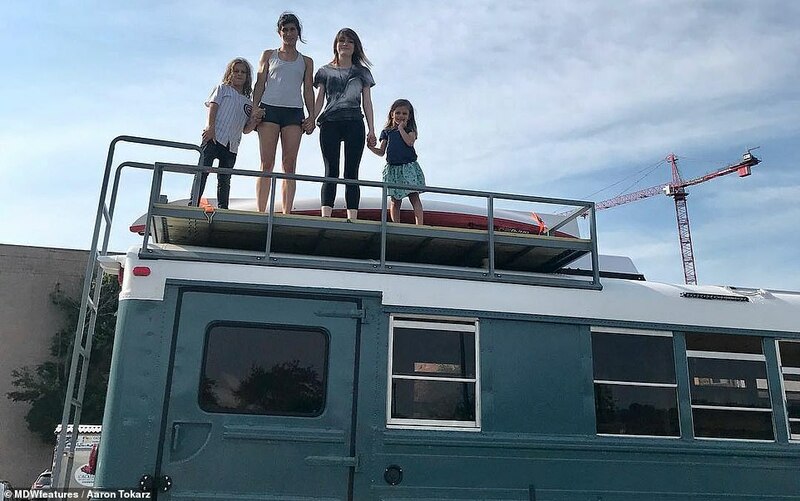 ‘We have 225-square-foot with a living/dining room, full kitchen, triple bunk beds, full bed for us, composting toilet, storage and an additional 70 square feet up on our roof deck. 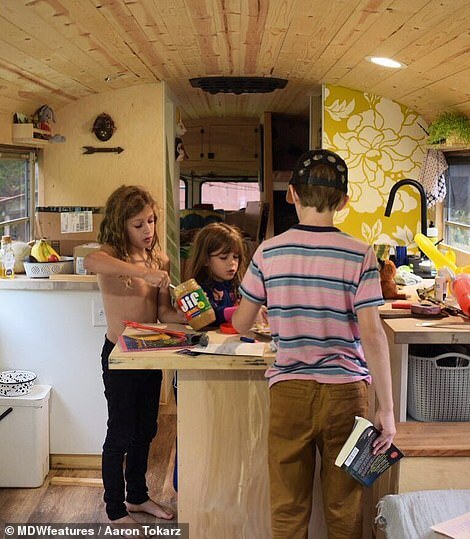 Besides the initial routine adjustments, reducing possessions, missing friends and family, odd breakdowns, passers-by wanting to ‘look inside’ and finding a place to park at night, living on a bus has given the family a positive experience that most people can only dream of. They say that have met so many interesting people and made many friends along the way and the children have learnt how to be respectful and kind to others, which they believe will have had a massive impact on their children’s future. Their three children are all being taught on the road through outdoor activities, occasional museum visits and guided online research, which has created a mixed response from each child. Aaron said: ‘It’s been a big adjustment and has been hard missing friends and family. ‘We have all done very well with the challenges though. One of the hardest parts is finding a place to park at night, but overall, it’s an amazing experience. ‘Being in the spotlight can be hard too. People are very curious about this lifestyle. You can be parked up alongside some street in a random town eating your dinner on the bus and all of a sudden people want to look inside. It’s been interesting. 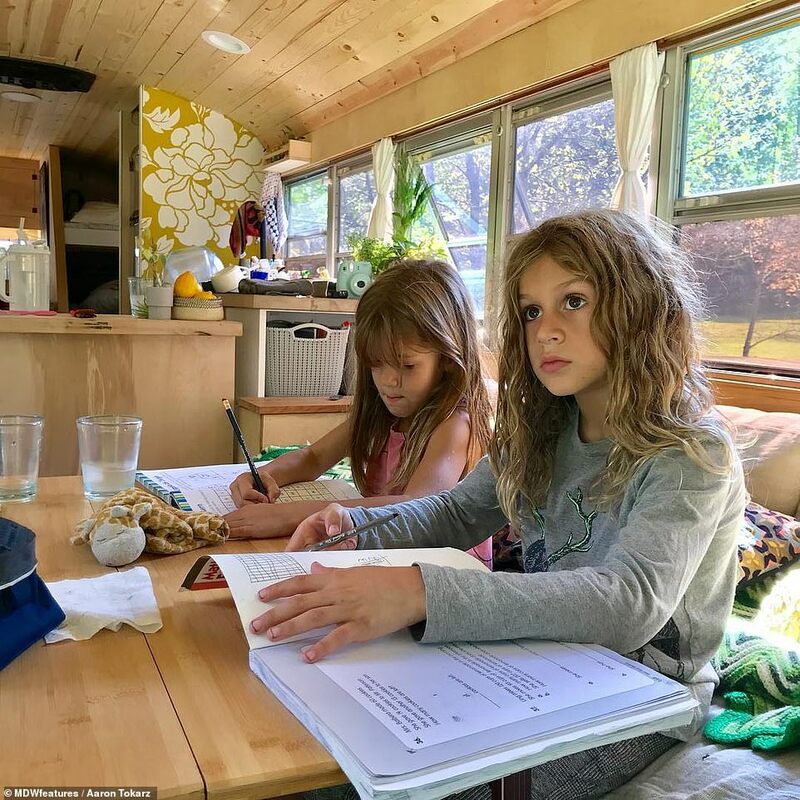 ‘We are “unschooling” our kids. Think of it as a more relaxed version of home-schooling. Wherever we go we always find something new to research when back on the bus. ‘Cashin says he wishes he was in school still. He mostly misses his friends. ‘Brig is more of an introvert so he would rather be learning this way. Freya was only in school for one year before we left so she doesn’t really care either way. I think we will see the benefits more later in life. ‘We have become closer since living on the bus. 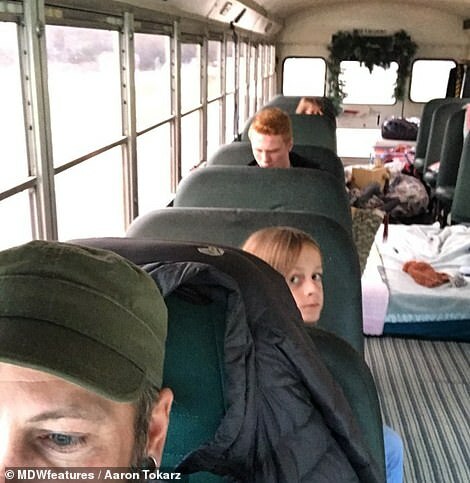 As the family approach their first-year anniversary on the bus, they have decided to continue living on it for at least another year and hopefully for a long time after. ‘Life is too short. If you have an idea, no matter how crazy it may seem, even if the timing doesn’t seem right, go for it! You’ll never know what life may bring unless you try,’ Aaron said.